Move over, Dominos, Pizza Hut, et al! Home made Pizza has arrived! Having finally got the hang of making pizza dough at home, weekends have become Pizza dinner days. With my easy tomato basil sauce stocked up in the fridge, along with pizza dough made every 2 weeks or so and frozen till the weekend, it takes 5 minutes to prepare the toppings and spread them on the pizza base. Into the oven and out again in 12 minutes or less. 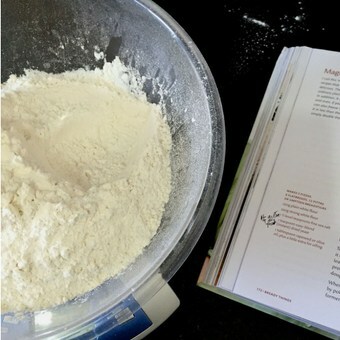 The recipe below for Pizza dough is adapted from the River Cottage Veg Everyday Cook book’s Magic Bread Dough Recipe. 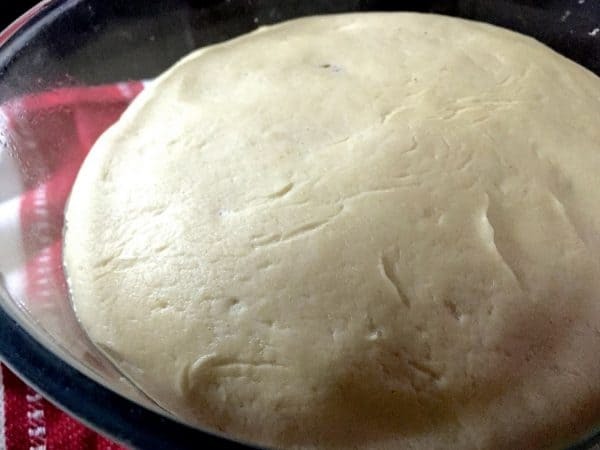 I had earlier followed recipes from Jamie Oliver as well as from the Greens cookbook, but have finally settled down with this recipe for Pizza dough, which I have tweaked for my own use. Jamie’s pizza dough is similar in method to the one below, however as it makes a large quantity of dough, I don’t often use it. 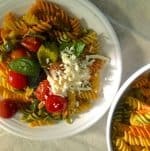 The Greens cookbook has a recipe for making pizza dough out of rye flour and wheat flour, and that is something I will be going back to, soon, as I want to shift from all purpose / maida flour to whole wheat flour. The ingredients listed below may be doubled to make more dough. I wouldn’t advise reducing it to make smaller quantities though, as the proportions for yeast, water and oil may not hold. Some amount of kneading is required, but as this is a soft dough, it is not difficult to knead. And it is good exercise! 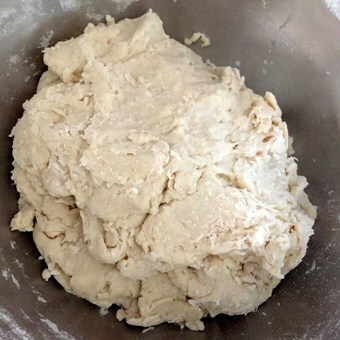 The recipe for pizza dough below follows the process of proofing the yeast before adding it to the flour, as this is a practice I invariably follow. 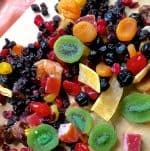 The original recipe does not require this to be done as quick blend yeast is suggested, whereas I use active dry yeast. Dough rising times can vary between 1 hour to 2 or more, depending on the climate as well as the potency of the yeast. Usually when I make the pizza dough at home at Bangalore, the dough doubles in size in under 2 hours. Similarly, the baking time varies from oven to oven. I usually set my oven temperature at 250 deg C and a thin crust pizza bakes in 10 minutes. Recently when I used another OTG oven where I set the temperature at 240, it took 15- 20 minutes for each Pizza to bake. Till recently, good quality yeast was not easily available in India. 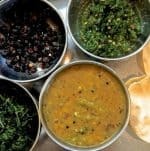 Now there are some premium qualities available in Stores that supply ingredients and equipment for Baking, such as Arife, in various cities, and online on Amazon. 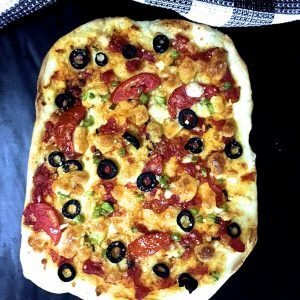 Recipe for easy to make Pizza Dough, for a thin crust pizza with your favourite toppings. Active dry yeast needs to be checked before using, to ensure it is alive. If the yeast is not active, the pizza dough will not rise. Heat water to just above lukewarm or room temperature - about 105 to 110 deg F / 40-43 deg C. I have yet to invest in a thermometer, so I test the correctness of the temperature by (cautiously!) dipping my (clean) finger into the water - if its hot, but I can keep my finger in comfortably for a count of 6 before it becomes unbearably so, then the water is right for proofing. If its pleasantly warm, then it is not hot enough! A note of caution though - different yeasts may require different temperatures for becoming active, so best to get a thermometer and follow the specific recipe/yeast package instructions. Add the yeast to a quarter cup of the water along with a pinch of sugar, and stir gently. After a few minutes some action will be visible, and after about 5 minutes some foam would have formed on the surface. 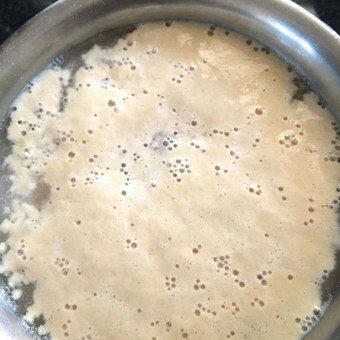 In 10 minutes, the yeast would become active and ready to go. Use it immediately. Weigh/measure the flour, oil and salt. Sift the flour with the salt so that the salt disperses in the flour. Make a well in the middle of the flour and add the rest of the warm water, oil and the yeast along with the water in which it was proofed. Stir the flour into the water. Use your hands to mix the flour into the liquid till you get a rough dough. Tip the dough onto a clean work surface and knead for about 10 minutes till the dough is smooth. 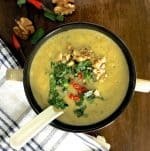 The dough would initially be sticky and loose and it is meant to be like that, so try not add any more flour or if at all, add as little as possible. As you knead, the dough becomes less sticky and smoothens. Shape it roughly into a ball. 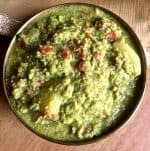 Drizzle oil into a large clean bowl and turn the kneaded ball of dough in it, so that the surface is completely coated with a thin film of oil. Cover with a clean kitchen towel and leave in a warm spot for the dough to rise. The dough needs to rise to double its volume. This may take between 1 to 2 hours, maybe more if the weather is dull. Once the dough has risen, place it on a clean work surface and knock it back by gently poking with your fingers. The dough will fall back to its original size, and is now ready to be made into the Pizza base. The dough will make 3 thin crust pizzas. 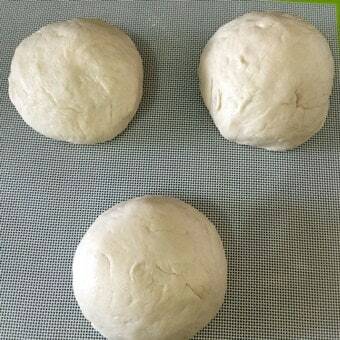 Place the dough on a clean work surface and divide into 3 equal portions. For recipes on baking the pizza with different toppings, please see the links in the Introduction or in the Notes below this recipe. Dough rising times can vary between 1 hour to 2 hours or even more, depending on the climate as well as the potency and freshness of the yeast. Usually when I make the pizza dough at home at Bangalore, the dough doubles in size in under 2 hours. Similarly, the baking time varies from oven to oven. I usually set my oven temperature at 250 deg C and a thin crust pizza bakes in 10 minutes. Recently when I used another OTG oven where I set the temperature at 240, it took 15- 20 minutes for each Pizza to bake. Check after 10 minutes and once the edges begin to brown, remove the pizza from the oven. 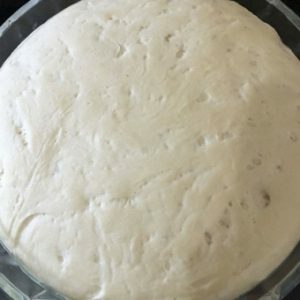 Does this pizza dough work for pita bread too? If so, any advise, pls, on oven temperature and baking time? Yes it does: Quoting from the original recipe in River Cottage Veg : Take egg sized balls of the knocked out dough, roll into 5mm thick oval shapes. Leave on a greased tray for 15 minutes, then bake at 220 C for about 8 minutes until they puff up and begin to brown. Remove and immediately wrap in a clean towel. The steam will help keep the pita soft. Allow to cool completely before unwrapping.